The civil engineer William Wheeler was a member of the first graduating class of Massachusetts Agricultural College in 1871, and was one of its most prominent alumni of the nineteenth century. In 1876, Wheeler joined MAC President William Smith Clark and two other alumni of the college in helping to found the Sapporo Agricultural College in Japan (now Hokkaido University), succeeding Clark as president of SAP from 1877 to 1879. In later life, he was a successful hydraulic engineer and long-time trustee of MAC (1887-1929). A small, tightly focused collection, the Wheeler Papers consist largely of letters written home by Wheeler while working at the Sapporo Agricultural College, 1876-1880. Typically long and descriptive, the letters include excellent accounts of travel in Japan and Wheeler’s impressions of Japanese culture, but they provide detailed insight as well into the work involved in establishing Sapporo Agricultural College. The civil engineer William Wheeler (1851-1932) was considered one of the most influential graduates of Massachusetts Agricultural College before 1900, with a long career in service to the College, his native Concord, and the Commonwealth. The fourth of eight children born to Edwin and Mary (Rice) Wheeler of Concord, Mass., Wheeler was not yet 16 when he entered MAC in October 1867, a member of the college’s pioneer class. An excellent student from the outset, he pursued an engineering course and although he was the second youngest member of his class, he rapidly became something of a student leader. Wheeler spent the summer after his junior year occupied in his first engineering job, working as a surveyor on highway construction projects and as engineer for the town of Amherst, and he filled in for Martin Fisk as instructor in Mathematics during the last semester of his senior year. After receiving his degree, second in his class, he worked for the Massachusetts Central and other railroad companies until opening his own firm in May 1873. Wheeler’s duties in Sapporo included teaching mathematics, civil engineering, and English, but ever industrious, he took on a variety of other projects as need, opportunity, and circumstance arose. As early as September 1876, he set up a small meteorological observatory and began systematically collecting weather data — perhaps the first such data scientifically recorded in Hokkaido — and under the auspices of the Kaitakushi (the Imperial Colonial Department), he conducted several surveys in Hokkaido for future transportation routes and oversaw the construction of a canal between Sapporo and Barato, among other projects. With the agricultural college on a firm foundation, Wheeler was selected to succeed Clark as president in 1877, and his organizational skills and foresight are often credited with ensuring its long term success. During his tenure as president, Wheeler oversaw many of the practical details that transformed the college from idea into reality, including the consolidation of the curriculum and the continued expansion of the model farm. Like his colleague Brooks, he interrupted his stay in Japan for personal reasons, marrying Fannie Eleanor Hubbard in Concord on July 17, 1878. The couple remained in Sapporo for the final year of Wheeler’s contract, finally returning to Massachusetts in December 1879. Resuming his career in civil engineering, Wheeler became widely known for his work on water and sewerage systems and was active in town affairs for many years, serving on a long list of town committees and overseeing a wide variety of civic projects. In 1880, Wheeler filed a patent for a novel form of lighting that he commercialized through the Wheeler Reflector Company, a highly profitable company that was an important manufacturer of street lighting into the middle of the twentieth century. 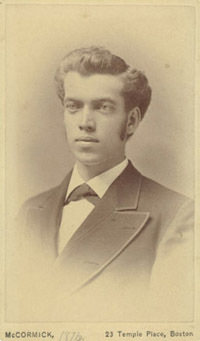 Also in 1880, Wheeler was selected to become the first alumnus to serve on the MAC Board of Trustees, and although he resigned the next year in a dispute over governance, he returned to serve on the trustees from 1887 to 1929. As trustee, he was particularly involved in the development of campus landscaping, overseeing the civil engineering associated with construction of a dam for the campus pond and other improvements to the grounds. He resided in his estate in Concord, Maru-Yama Kwan, named in memory of his stay in Japan, until his death on July 1, 1932. A small, tightly focused collection, the Wheeler Papers consist largely of letters written home by the civil engineer William Wheeler while President of the Sapporo Agricultural College, 1876-1880. Typically long and descriptive, the letters include excellent accounts of travel in Japan and Wheeler’s impressions of Japanese culture, but they provide detailed insight as well into the work involved in establishing Sapporo Agricultural College. The collection also includes photocopies from Hokkaido University of documents relating to Wheeler’s tenure as President there, seven letters written after his return to the United States, two biographical sketches, and copies of a journal he kept while exploring Death Valley, California, in 1900. The Order or the Rising Sun, 5th Class, is housed separately. Please use the following format when citing materials from this collection: William Wheeler Papers (RG 2/3 W54). Special Collections and University Archives, University of Massachusetts Amherst. Acquired from the Wheeler family, 1921, 1961. Reprocessed by rsc, June 2007. See also the papers of Wheeler’s MAC colleagues in Japan, William Smith Clark and William Penn Brooks, and for additional information on American travelers in Meiji-era Japan, see the papers of Benjamin Smith Lyman. Memoir prepared for Social Circle in Concord, Mass. In Japanese with English summary. Documents associated with award of the Order of the Rising Sun. Order of the Rising Sun, framed outside Chancellor’s office.